The Museum of Family History is pleased to announce that it has been accepted as a member of the AHO, i.e. the Association of Holocaust Organizations. The AHO has, as its members, over two hundred and eighty organizations, including the United States Holocaust Memorial Museum and the Museum of Jewish Heritage. According to the AHO, The Association of Holocaust Organizations was established in 1985 to serve as an international network of organizations and individuals for the advancement of Holocaust education, remembrance and research. The AHO website can be found at www.ahoinfo.org. The Museum of Family History now has a blog. News about the Museum’s goings-on, mostly new and upcoming exhibitions. One can easily subscribe to it, so please consider doing so. The URL for the Museum's blog is http://museumoffamilyhistory.blogspot.com. New exhibitions will be announced via the Museum's blog before they are announced within this Recent Updates page. 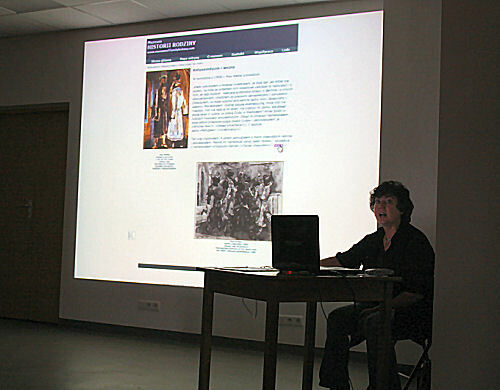 The Museum of Family History made a special appearance in Bialystok, Poland on September 4, 2009. At this time an exhibition opened, the first in a series entitled "Prominent Artists--Our Neighbors. Max Weber." Max Weber was a well-known Jewish artist (born in Bialystok) who studied under Henris Matisse and Rousseau, who painted in a variety of styles, who at times painted wonderful works with a variety Jewish themes, usually religious. Currently, the English version of the Max Weber exhibition (entitled "Max Weber: Reflections of Jewish Memory in Modern American Art") can be found at www.museumoffamilyhistory.com/mweber-01.htm . The Polish language version of the exhibition can be found at www.museumoffamilyhistory.com/mweber-01p.htm . Steven Lasky, Founder and Director of the virtual Museum of Family History, spoke at the IAJGS (International Association of Jewish Genealogical Societies) conference in Philadelphia on August 3, 2009. The title of his presentation was be "A Day at the Museum: Navigating the Museum of Family History." More can be learned about the August conference by visiting www.philly2009.org . On November 16, 2008, Steven Lasky, founder of the Museum of Family History, gave a presentation about the Museum's Cemetery Project during the Lucille Gudis Memorial Fund All-day seminar, "From Here to Eternity: Jewish Cemetery Research, Preservation and Restoration." 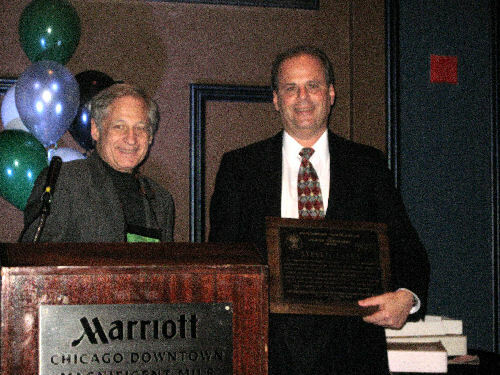 "Presented to Steven Lasky....In recognition of his original contribution to the Jewish genealogical community by the creation of an online virtual museum, The Museum of Family History. This impressive and professionally-produced body of work reflects his hard work and dedication in accumulating, recording and sharing an incredible variety of relevant resources. Designed to encourage Jewish families to research and document their own family histories, Steve's inspiration will continue to benefit future generations." The site was constructed to educate and inform readers about the history of the Jewish people as seen through the eyes of our families, and from the families' sojourn in Eastern Europe through the years in countries which would eventually be their new homes. When we visit his museum, we learn of the collective struggles and the triumphs of the Jewish people, and gain insight and understanding of the world in which they lived. The site strives to be an everlasting tribute to all our families, to their traditions and their way of life. The stories told add greater meaning to historic events that have dominated Jewish history for nearly two hundred years. There are many facets to the site. The “Postcards from Home” exhibit includes photographs and documents contributed by Steve’s own family and others with a keen interest in this worthwhile project. Our family history, according to Steve, is sacred and he encourages us to preserve our own cherished family memories for future generations. Storytelling, he says, from grandparents and parents to their children in the time-honored oral tradition, adds to identity and continuity. He hopes to inspire readers to do more to transmit their own family memories to future generations. The Museum of Family History, www.museumoffamilyhistory.com, offers a site map that provides visitors with a useful navigation tool to either browse, or use as an index to find specific material. The site features many exhibitions and topics of interest. Steve has created three Links pages, the largest of which contains more than four hundred hyperlinks to sites of interest for Jewish genealogists, as well as two additional pages for Holocaust-related sites and Yiddish theater and culture. The Education and Research Center provides examples and explains documents available to the Jewish genealogist. Visitors should frequently check the Recent Updates page for a listing of new material and exhibitions. He depends on the Jewish genealogical community to contribute photographs, stories and material to supplement the exhibitions. Check the Opportunities Page under Call Box for specific needs. The matzeva (gravestone) offers important genealogical information for researchers. Steve has photographed more than 85,000 gravestones over a three-year period in the New York metro area, and has created an impressive Cemetery Project with this information. He is always willing to do lookups for researchers and provide photographs of gravestones if he has them. Also available are unique surname lists for cemetery society plots. Researchers can check surnames lists for specific towns and may contact him for more information. His dedication to Jewish genealogy and his desire to make material interesting and accessible inspires genealogists to continue their investigations, while involving individuals more directly in their own family research. Thank you, Steve, for your devotion and determination in creating a useful asset for all genealogists. I gave my very first presentation on behalf of the Museum of Family History to my local Jewish genealogical society, the Jewish Genealogy Society of Long Island (JGSLI), on 25 Feb 2007. The meeting was attended by more than sixty people. This was my first public speaking in twenty-five years and though I was a bit apprehensive, I enjoyed it very much! I would like to thank the board of JGSLI for asking me to speak and also my thanks go to all those who were nice enough to attend. I look forward to my next talk at the IAJGS Conference in Salt Lake City, Utah 15-20 Jul 2007. What has been added to the Museum web site since it was last updated in September? Plenty. The web site's graphics have changed dramatically and much more content has been added. More exhibitions are available for viewing: Under the banner of "Lives in the Yiddish Theater," you will be able to read about the Fischer family who once acted in the Yiddish Theater in Warszawa and read about the renowned Yiddish playwright David Pinski. I have also written a review of the wonderful 1936 Yiddish film with Molly Picon entitled "Yidl mitn Fidl." Under "Works of Yiddish Writers," you can read a short story (available in both English and Hebrew) that was written in Poland in the 1930s and published in the magazine "Shtern" in 1940. The author of this story Szoel Frydman (pseudonym Leib Rashkin), who was from Kazimierz Dolny, perished in the Shoah (as did most of the Fischer family mentioned above.) You can also read about famed Bialystok-born painter Max Weber and renown Yiddish actor Maurice Schwartz, and even read a biography about him. To come is a further expansion of the Pinski material as well as an exhibition about American tenor Richard Tucker, and yes, the immortal Al Jolson. There is much more new material added to the Museum's Yiddish World. There are central web pages for more than forty towns and cities in Poland (with the except of Vilnius, formerly part of Poland, now in Lithuania, and Czernowitz, in today's Ukraine), with more to come. Each page serves as a "main staging ground" or index for what is available onsite for that particular location, both within the virtual walls of the museum, and outside of it. For example, for those who are researching the town of Zambrow, Poland, the use of the main Zambrow page will allow the visitor to locate all the material within the museum that is related to the town of Zambrow, such as family photographs, immigration lists, Cemetery Project material, maps, etc., as well as links to other sites outside of the museum that also might be of interest to Zambrow researchers. New to the museum are nearly thirty immigration lists, i.e. the names, year of immigration and approximate year of birth of those who resided in a certain town or city before their emigration from Europe. These lists contain the names of emigrants who last lived in such towns and cities as Bialystok, Czestochowa, Krakow, Ostrow Mazowiecka, Lodz, Suwalki, Warszawa and Vilnius. The lists include all emigrants, i.e. Jews and non-Jews alike. The Suwalki and Vilnius lists contain nearly 20,000 names and the Warszawa list contains more than 46,000! You will also find dozens of topographical maps, for the most part taken in Poland in the 1930s (some even earlier), all of which deal with territories located in today's Poland. For those who are interested in learning more about the cursive script that ship officers used while entering the names of our immigrant ancestors in their ledgers, you can enter the museum's "Education and Research Center," and look at examples of the various errors that were made in the entering of the many names from the ledger to the Ellis Island database (EIDB). There are also samples of upper case letters written in script at the port of Antwerp during many of the years ranging from 1898 to 1914. This might be beneficial for those who visit this web page as it might aid in the location of names that have been misspelled and cannot be located, and suggest other (incorrect) spellings that might aid in the search. There are also many examples of vital records that are important to the genealogist, along with explanations of these records and what information is on them. As for the oft-visited Cemetery Project, cemetery grounds maps has been added for cemeteries in Los Angeles and for Waldheim Cemetery in Forest Park, Illinois. New unique surnames lists have been added, though this aspect of the project has slowed considerably (at least for the time being). If you visit the Society Gates exhibition, you will see that it has been greatly augmented. Here you can see the society gates and posts that were erected to commemorate the society and its members. Listed are the names of the many society officers and members who once populated these landsmanshaftn and synagogue societies (i.e. when the names inscribed are readable, and haven't been completely eroded by time and the elements.) Also there are now three exhibitions that pay tribute many of the extant Holocaust memorials, located both in North America (New York, New Jersey and Florida), as well as in many countries in Europe and Canada. You will be able to see photographs of these memorials as well as read what was carved into the stone, e.g. names those who once lived in Polish towns but died in the Shoah. The Postcards from Home exhibition has changed both structurally and in content. Many of the more than fifteen hundred family photographs that were taken in pre-war Eastern Europe and sent to this museum have now been given their own web pages, or at least grouped together on one or more pages by family-- when available, short biographical information or personal testimony is added. There are now at least two ways to search for family photographs of interest. You can now search by the name of the town where those in the photos were from (or occasionally where the photo was taken), or you can search by surname. On the surname search pages, the names are arranged alphabetically, with the names of the town and web page name listed adjacent to the surname. Though no hyperlinks are available for these listings, you can easily reach the desired page by reverting back to the town search pages and locate the page/link by town name. You will see that, although the majority of the photographs were taken in Poland, there are family photos from many countries in Eastern Europe and a few from the West. I would like to again implore you to send more of your pre-war Eastern European family photos to the museum, so that they may serve as a welcome addition to this exhibition. It would be a wonderful tribute to your ancestors, as it will honor and and perpetuate their memory. You can contact the museum at postmaster@museumoffamilyhistory.com for more details. The Museum of Family History is a virtual (Internet only) museum that is both interactive and multisensory. Unlike the first version of this web site, you will now find short audio clips (signified by the earphone symbol ). You will possibly have to have Windows Media Player installed on your computer to listen to the audio, or it might just play on your default audio player. You can try listening first with what you already have installed on your computer, and if that doesn't work try the free download at Windows Media Player. You can know see film clips to a dozen documentaries with Jewish themes. Please visit the first exhibition of the "Family History Theater" entitled "Family Life During the Great Depression," and listen to a few recall these difficult times. Also, please visit the current exhibitions "A Photographer's Life," "Windows in Time," (wonderful photographs taken by Henry Nathanson during his tour of 1913 Europe and the Middle East), and the newest ones, "Holocaust Memorials in Canada" and "The Life of Nina Finkelstein: Recollections of a Friend," which talks of the early life and survival of Nina Finkelstein during World War II in the Kovno Ghetto. A new exhibition is now online that deal with the early history of photography and the photographic studios in Eastern Europe. January 2008: The Museum of Family History has been mentioned and linked to on a webpage for the recent PBS (Public Broadcasting System) documentary "The Jewish Americans." You can find the link here . Enjoy your visit to the Museum of Family History!